These moist and zingy lemon Valentine cupcakes are crowned with delicate pink roses piped from raspberry Swiss; a truly delicious treat! 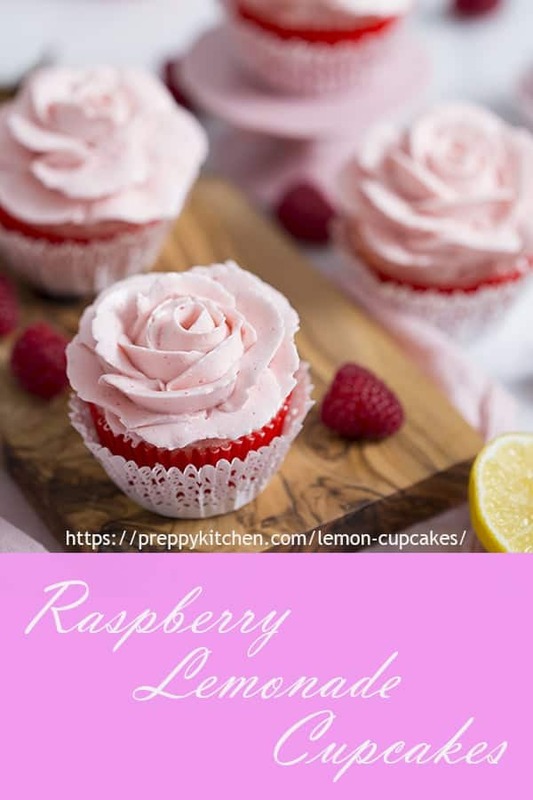 These lemon cupcakes topped with raspberry-flavored buttercream are the perfect treat for any occasion but especially appropriate for Valentine’s day! 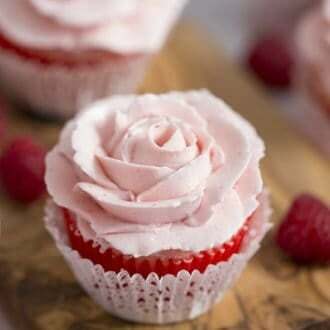 A dozen roses are a nice gesture but a dozen rose cupcakes are a delicious surprise. How do You Pipe Buttercream Roses? Piping buttercream roses is actually pretty simple once you get a little practice in! I used a 125 tip for the petals and made sure to start off by creating a cone-like base of buttercream to build the flower on. Making that cone creates height at the center of the flower for a more realistic look. Start with a spiral at the center then make little arcs for the petals that get larger as the flower reaches completion. I have a COMPLETE how to video and post on the blog for buttercream flowers. Check it out if you have any questions! I made a batch of the cupcakes flavored with the 3 tablespoons of the raspberry reduction but they turn lilac after baking. Not the end of the world but wasn’t the look I was going for. Making the raspberry reductions takes a minute or two so if you’re in a hurry try adding in some strained preserved or a bit or the juice from frozen raspberries instead. How Do You Make Valentine Cupcakes? For the raspberry reduction; put all of the ingredients into a medium sized pot and place over medium heat. Simmer until a syrup is formed. Strain the syrup into a bowl and use a spatula to help push all the juices through. Now place it in the fridge to chill. For the cupcake; Preheat the oven to 350 degrees. Line your cupcake pan with papers and sift all the dry ingredients including the sugar into a medium sized bowl. Give it a whisk and set it aside. Add all of the wet ingredients into a separate bowl and mix until everything is well incorporated. Add food coloring to get a pink wet mixture. Combine the wet ingredients to the dry and whisk until everything is well combined. Pour the batter into the prepped pan and bake for 12-15 minutes or until the centers are springy to the touch. Remove them from the oven and set aside to cool. For the Swiss buttercream; Place the egg whites, sugar and salt into a glass bowl. Transfer the bowl over a pot of simmering water making sure the bowl does not touch the water. Whisk continuously until the mixture reaches a temperature of 160 degrees or until the sugar has dissolved. Transfer the mixture to a stand mixer and mix on low too high to get soft peaks. Mix until the mixture reaches room temperature then add butter 1 tablespoon at a time and the orange blossom water. When your buttercream is finished, put some in a separate bowl and whisk in a tablespoon of the raspberry reduction. Now place it into a piping bag fitted with a 125 tip or a medium petal tip. For the assembly; Spread out a dollop of buttercream as the base of your cupcake. 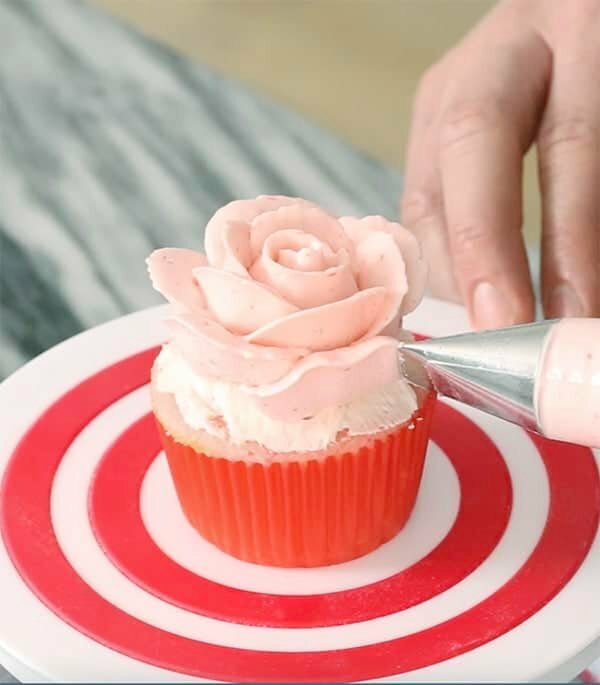 Pipe a spiral in the center of the cupcake then begin piping small petals making them larger as you go. You can always practice first if you please! If you’ve tried these Valentine cupcakes then don’t forget to rate the recipe and let me know how you got on in the comments below, I love hearing from you! 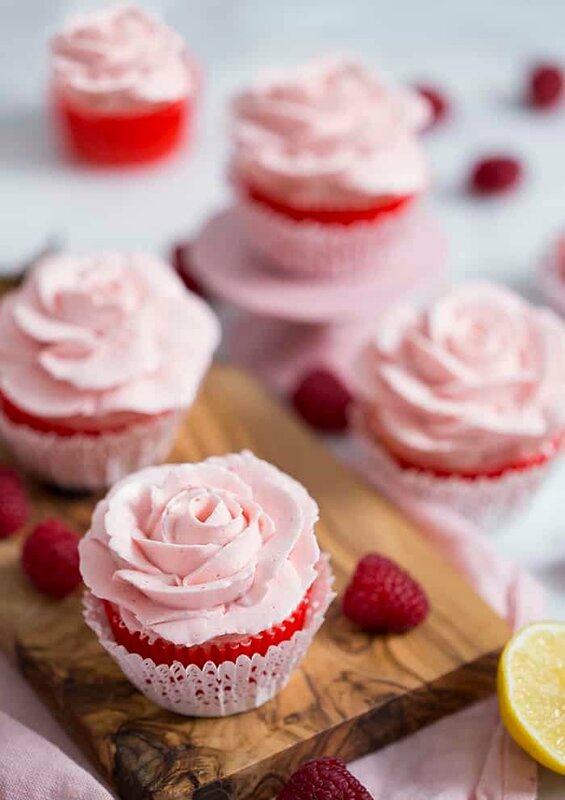 These moist and delicious lemon Valentine cupcakes are topped with a silky Swiss meringue buttercream flavored with a zingy raspberry reduction pipes into delicate roses. Put raspberries, lemon juice and sugar into a small pot and place over medium heat. Break up the raspberries with the back of a spoon and simmer until reduced by a third or so. Use a spatula to help strain into a bowl. Place in fridge to chill. Preheat oven to 350 degrees. Prep your cupcake pan by lining it with cupcake papers. Sift the dry ingredients including the sugar into a medium sized bowl. Give it a whisk. Set aside. Add all of the wet ingredients into a separate bowl and whisk to combine. Add the soft pink food coloring to the wet mixture a drop at a time. whisk and add more if the color isn't saturated enough. Combine the wet to the dry ingredients. Whisk to combine. Pour batter into prepped pan. Bake for 12 to 15 minutes or until the centers are springy to the touch. Place egg whites, sugar and salt into a glass bowl. Transfer the bowl over a pot of simmering water. Make sure the bowl does not touch the water. 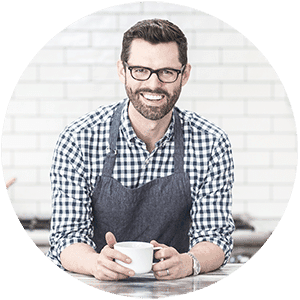 Whisk continuously until the mixture reaches an internal temperature of 160 degrees or until the sugar has dissolved. Transfer to a stand mixer and mix on low to high to get soft peeks. Mix until the mixture reaches room temperature. Add butter 1 tablespoon at a time. Wait until each piece incorporates before adding the next. Add orange blossom water or vanilla extract. Put some of the buttercream in a separate bowl. Whisk in a tablespoon of the raspberry reduction at a time until desired flavor and color are reached. Spread out a dollop of buttercream as the base of your cupcake. 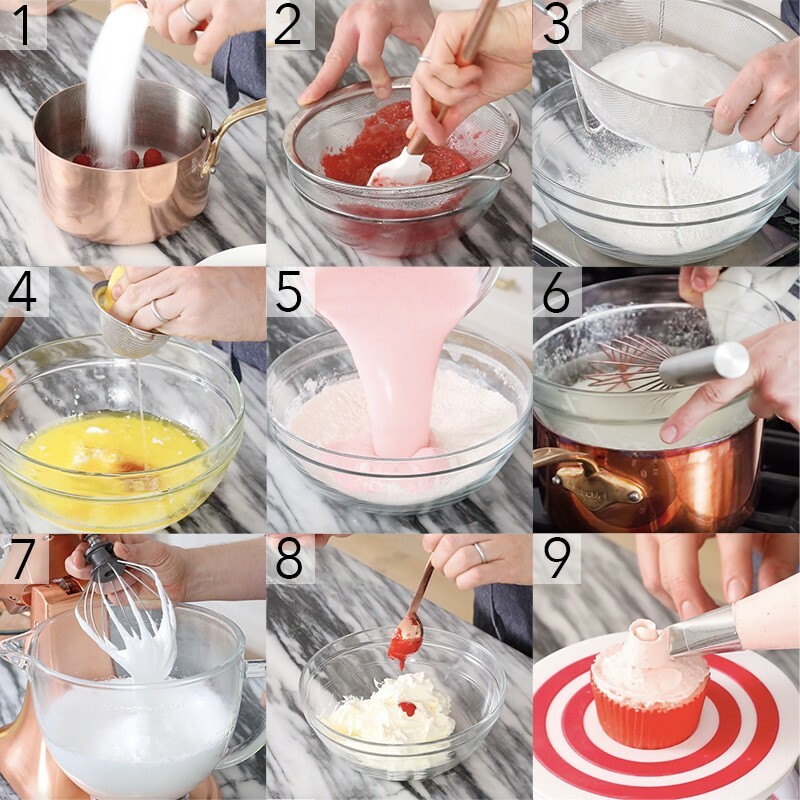 Place the soft pink buttercream into a piping bag fitted with a 125 tip or a medium petal tip. Pipe a spiral in the center of the cupcake. Begin piping small petals. Make them larger as you go. I made a batch of the cupcakes flavored with the 3 tablespoons of the raspberry reduction but they turn lilac after baking. Not the end of the world but wasn't the look I was going for. Making the raspberry reductions takes a minute or two so if you're in a hurry try adding in some strained preserved or a bit or the juice from frozen raspberries instead.